Wow. This one takes me back. Let me see if I can come up with some tracks on this sucka. All I got at the moment. You go man! sooooo Manny memories I always bought all of your tapes from Ken and lost them all one time my car got broken into at a party at the San Bernardino Sports Arena. Will love to see more of them on this page since i live in Argentina now and they are impossible to replace. You always made the party move bro. I remember ordering this from Thee-o, and he sent my a different tape because he had sold out on this one. Still have that ‘post-it’ he wrote on telling me he was out. Now, I get to listen to it after 16years. I remember it was very popular back in its day. 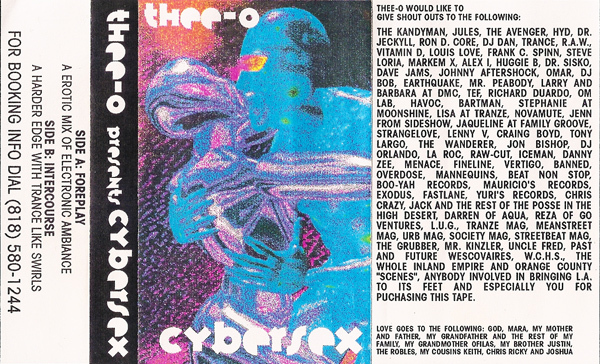 Thee-o was the LA king of Dj mix tapes in the LA underground!